This will be The Build Thread for my wife’s 1984 T Top Factory Black Coupe. If you are wondering…yes my wife is working on her own car. She has been in the garage with me for hours already working on removing the interior, cleaning the interior pieces we are going to re-use and she is helping me pull the engine and trans this weekend. Here it is in our garage before we touched it---and yes it is leaking on my nice new garage floor!!! Last edited by only5.0s; 06-16-2014 at 02:47 PM. Interior when it arrived-had seats from an 87-93 gray and the rest of the interior was some crappy light blue color. The interior will be completed once the car is back from Pro Tree-it will be the last piece of the puzzle. We did however already prep and paint the dash. The interior will be all black. I will paint all the plastic interior pieces black(I did this in my Fox 3 years ago and it still looks perfect-need to prep the pieces by cleaning them thoroughly, use adhesion promoter and then numerous coats of trim paint). We will have the door panels re-done and buy everything else black(dash pad, rug, arm rests, headliner, seats etc. Here is the new black dash. Last edited by only5.0s; 04-30-2014 at 03:07 PM. Last edited by only5.0s; 10-15-2011 at 03:26 PM. Last edited by only5.0s; 10-15-2011 at 08:13 PM. Glad to see youre already working it. Mark, Id keep the crank windows. Old school cool. So will the black interior be. I also have to say...I never owned a four eye Fox and never had any desire to own one, but I have to say now that we have one..I am really into it and realize how cool they are. 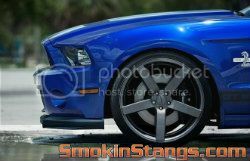 SmokinStangs.com is excited to have a build project like this to follow along and share in the action . Looking forward to this exciting & most interesting project. As I always say....We all can't be doing build projects all the time, so it's great to have a front row seat when one is taking place!! Engine and trans removed today. Thanks to my buddy Wayne for coming over and lending a hand. We completed this task in a little over 4 hours. Last edited by only5.0s; 10-15-2011 at 04:15 PM. Mark, the attachments don't seem to be working, at least not for me on Firefox. Can't wait to see!!! Never mind... working now. I see you edited. Very nice job! Looks like the PFH car about 2 years ago before ED painted the bay. Good luck with the project! Last edited by ToplessPony94; 10-15-2011 at 03:49 PM. Reason: Follow-up.